Dongi Lee received a BFA and MFA in Painting from Hongik University in Seoul, Korea, in 1990 and 1995, respectively. Blurring the boundaries between high and low art, Lee, as the first generation of Pop artists in Korea, appropriates prevalent themes from mass media and popular culture. 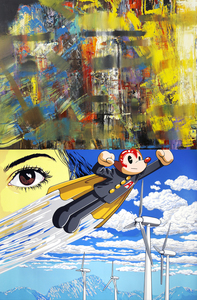 His works are characterized by flat planes of color and graphic images often involving a character style, Atomous. As a matter of fact, his representative series of works titled Atomous is created by merging two distinctive characters: “Iron Arm Atom” from Japanese manga and “Mickey Mouse” from Walt Disney. This combination of Asian and Western iconic cartoon characters is the artist’s response to the effects of emerging globalization. Furthermore, his Atomous is an identity that is very much of our time – culturally specific yet ambiguous and heterogeneous. Becoming passionate about delivering popular culture through his works of art, Lee provides viewers with clues to a chaotic modern world. In most of his works, Lee not only reflects our perception of reality but also embraces the new world of capitalism in great detail. Selected solo exhibitions include Galerie Michael Schultz in Berlin, Willem Kerseboon Gallery in Amsterdam, Gallery 2 in Seoul, Gallery Mook of Contemporary Art in Beijing, One and J. Gallery in Seoul and Ilmin Museum of Art in Seoul. Selected group exhibitions include Kunsthalle Dresden, Beyond Art Space in Beijing, Alternative Space Loop in Seoul, National Art Museum of China in Beijing, Maison des Arts de Creteil in Paris, MOCA Shanghai, National Museum of Art Deoksugung in Seoul, Canvas International Art in Amsterdam, Sungkok Art Museum in Seoul, Fukuoka Asian Art Museum, Leeum in Seoul, Marronnier Art Center in Seoul, National Museum of Contemporary Art in Gwacheon and Artsonje Center in Seoul. He is represented by Galerie Michale Schultz in Berlin, Germany, Willem Kerseboom in Amsterdam, Netherlands, and Gallery 2 in Seoul, Korea. Dongi Lee lives and works in Seoul, Korea.